They are brought low, and he does not perceive it. And his soul will mourn over it. In this prayer Job is terrified of God and can’t understand why He is against him. In Job 13:23 and 24 Job prays, “How many wrongs and sins have I committed? Show me my offenses and my sins. Why do you hide your face and consider me your enemy” (NIV)? It is interesting to me that Job does not credit the devil for anything. He blames God for all his pain—that He is behind it all. And ultimately Job was right. The devil did have a hand in it, but God was always in control. He, in a sense, was directing Satan, and he could put a stop to it at any time. I think we sometimes give too much credit to Satan. It is God who controls all things. In Job 14:13-17, Job, in desperation, prays for death to escape God’s anger. Then he also prays for resurrection, and that God would forgive all of his sins. Job prays, “All the days of my hard service I will wait for my renewal to come… Surely then you will count my steps but not keep track of my sin. My offenses will be sealed up in a bag; you will cover over my sin” (NIV). What a blessed and hopeful prayer. For Christ does cover all the believers’ sins. 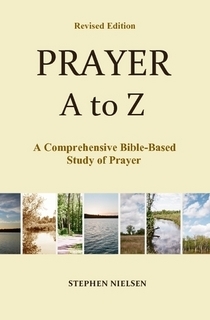 This entry was posted in Part 1, Abraham to Moses, Prayer A to Z Excerpts and tagged prayer. Bookmark the permalink.